All of the children in Koala class had a fantastic Friday. We played together on the trampoline and the slide during Discovery Time, then cleaned up to have our Morning Meeting. Everyone followed along with big voices and gestures. 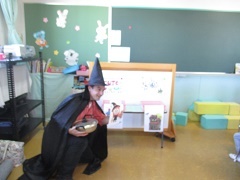 For today’s English lesson we learned about ‘cute’ and ‘scary.’ The children separated cute and scary ghosts, witches, and skeletons, but a witch came and mixed them all together. 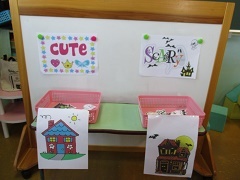 The kids had to work hard to put the monsters in the cute or scary houses. 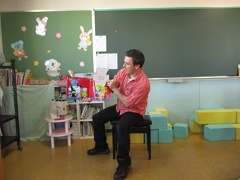 Then we all danced and sang “Halloween is Here.” Before lunch we also read a spooky story book. We got ready for packed lunch, and all the children can wash their hands by themselves. After lunch we practiced a fun song using hand bells. Have a great weekend everyone!